Sony’s mobile division started off well – it was making more per phone than any other Android maker. But the company will not reach its 20 million phones shipped forecast – it already cut it once by a million and now by two more. 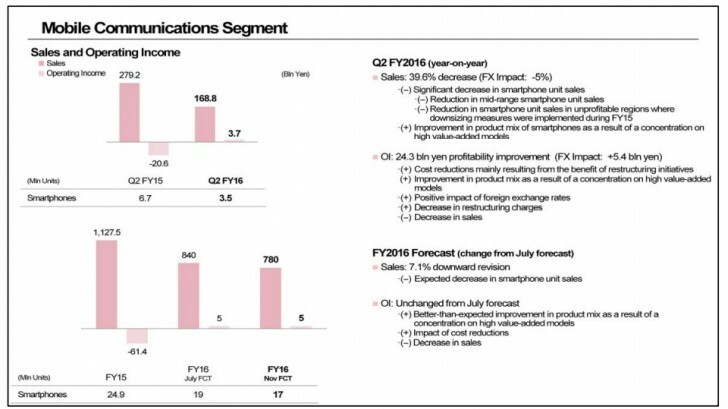 In total, Sony’s forecast is that it will ship 17 million Xperia phones. The blame has been put on Europe. On the positive side, the forecast for operating income for the year remains unchanged as Sony transitions into higher value phones (its mid-range phones are underperforming). The mobile division even scored a small profit ($37 million) for the quarter, compared to a loss the year before, and aims to end the fiscal year in the black. However, sales for the full year have been revised down. Just this last financial quarter the sales slumped 39.6% year on year to $1.67 billion.